Did you know Greg Gamble is 4-0 ATS? If your're looking for my Saturday CFB ATS Play...thank me Monday! ...and like UPS he simply delivered the goods with style! While both teams rolled Colonial Athletic Conference teams (Northeastern & Towson) to open the season, Navy’s unwillingness to practice their passing game in a rout is somewhat disturbing to yours truly (4 attempts, 2 completions). 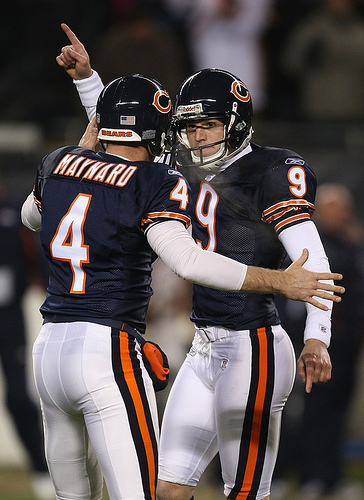 BTW, did you know 1 of the 5 solid players on the Bears, Brad Maynard, went to Ball State...that has to be a sign! Along the same lines, ARIELLE KEBBEL (click here) did not. Don't turn your back on girl wearin' Ball St. colors! As for Ball St., after years of hanging in the cellar Coach Brady Hoke has changed the culture in Muncie, IN and seen his squad improve their victory total in each of the past four seasons and finally took them to Bowl game last year (not exactly sure when the last one happened, but I have no interest to look it up). The biggest reason for even more optimism this season is the return of one of the most underrated signal-callers in the nation in Jr. Nate Davis. After a solid freshman season for Davis (18 TDs, 8 Ints, & 62 comp%), he exploded last year for 30 touchdowns, only 6 interceptions, and broke just about every passing record in Cardinal history. When I was in college it was never cool to bet on Ball St. or look for Cougars at the bar, but now...I ain't in college! While opening against Northeastern is not what you call a true-test, Davis was masterfully efficient completing 21 of 24 passes for 3 tuddies and zero INTs. As for a ground game that struggled the 2nd half of last year, the return of the diminutive MiQuale Lewis from last season’s 5th week ACL injury showed the Cardinals balanced potential. While the 5-6 junior has missed huge chunks of his first two seasons, he’s been remarkable when on the field with a 5.5 average in over 150 carries. And...just trust me on Friday Night BEEATCHES! ...they'll lose. Have a great weekend Homeboys! This page contains a single article from September 5, 2008 1:22 PM. The previous days article was GREG GAMBLE'S NFL ATS PICKS & LUV.